I have a confession to make. This is my first lobster roll ever. EVER. Before getting started, I did a little research online googling and people are very passionate about lobstah rolls. There seems to be a lot of “discussion” about the “right” way to make one. Passionate fussing discussions. From what I gathered there is the Maine Lobster Roll that includes mayo and celery and then there is the Connecticut lobster roll which is butter based. Since I’m not a huge fan of mayo (GASP much to my family’s chagrin) I took the butter road. You’re not surprised are you? Not just any butter the Land O’Lakes Butter with Olive Oil & Sea Salt road. Have you seen this new butter from Land O’Lakes? Oh sweet Mamma. It combines olive oil and sea salt into one butter-riffic package. It’s brilliant. It’s time saving and me and the Larry the Lobstah here couldn’t get enough. 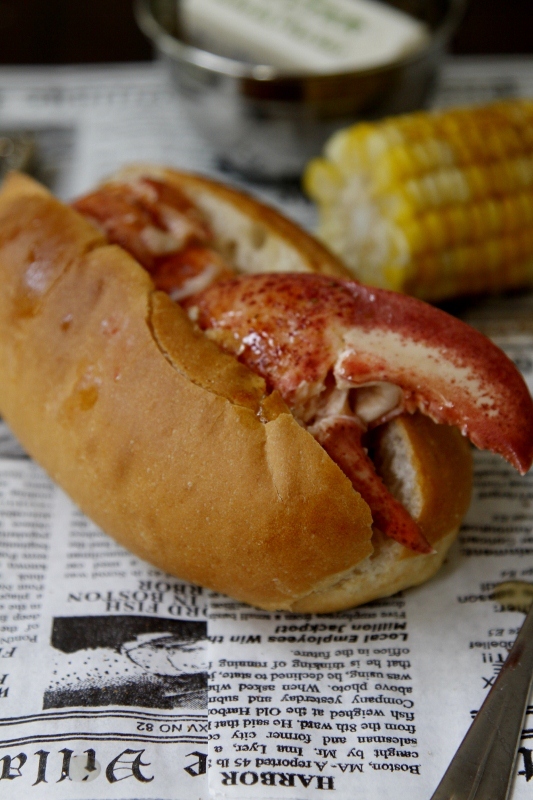 To make MY Connecticut-esque (in case the Lobstah Roll police are reading wink wink) Lobster Roll you’ll need just 3 ingredients and about 10 minutes. You can do that right? 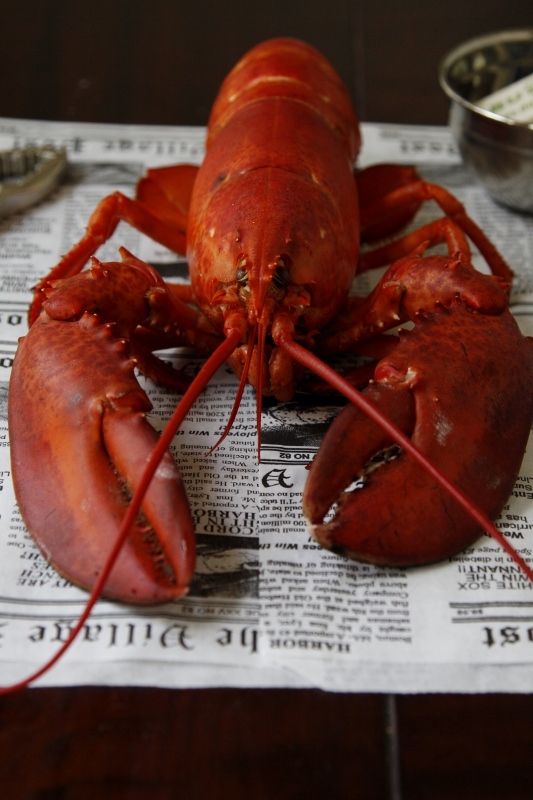 Lobstah – Pick one up from your fish monger and have them steam it right there for you. Buttah – Land O’Lakes Butter with Olive Oil & Sea Salt – melted to liquid gold perfection. Rolls – now there’s a lot of debate about rolls. I couldn’t bear to put lobster on a hot dog bun. It seemed wrong.Very wrong so I went with a more elegant Bolillio bun. I say use what you like. All that’s left to do is dismember the lobstah (save those shells and make a lobster stock, ah the sauce you can make with that – swoon) and give the meat a rough chop. Then for the liquid gold. And napkins, you’ll need a few of those too! For all things Land O’Lakes follow along on TWITTER & FACEBOOK! 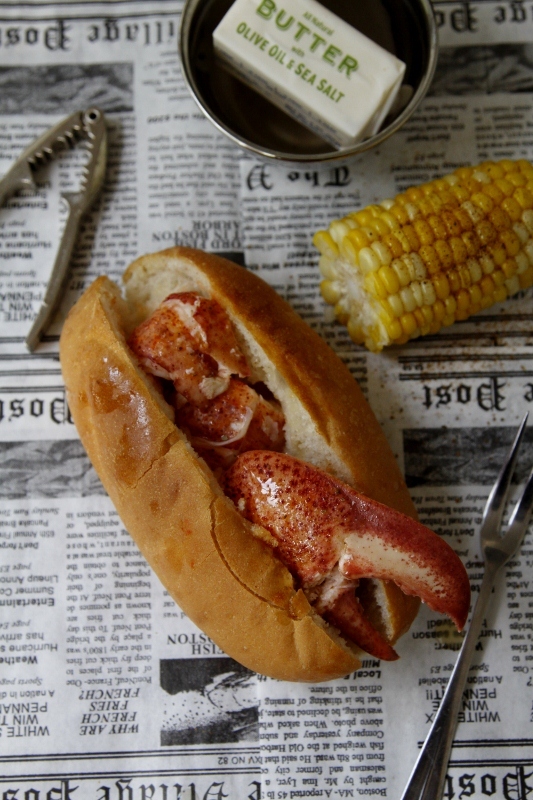 I’ve never had a lobster roll either, these look amazing! haha I love how the claw is sticking right out in the picture. Looks great! Oh it really looks delicious!! I love lobster and the olive oil butter should be very tasty. Great! Now that’s a good sandwich. It’s been years since I’ve had a lobster roll and it was the mayonnaise kind. i’ve never had a lobster roll but i’m thinking the Connecticut version sounds right up my alley! I’ve been DYING to make lobster rolls for like, ever. These are so rad. I’m a mayo girl all the way, but I’d be willing to try this 🙂 It looks so buttery and incredible! And now I’m off to eat my vegetarian burger. if i lived closer, i would be over for lunch, right now. These look amazing! I’ve only had a lobster roll once, but this one looks so much better. Thanks for the great recipe! I love love love that butter from Land O’Lakes! I made seared scallops with it, and it as amazing! No disrespect to the folks who prefer mayo, etc., but these butter drenched chunks of lobster are IT. Thank you, Paula! Holy lobster! Those look sooooo tasty!!! Dear God, I want that ever so badly!! Delish!! Oh good. I’m not the only one obsessing about lobster rolls. I have a lobster roll recipe I’m excited to try this week. This one will have to be next. Thanks! Don’t you just LOVE that butter? Mercy, it is amazing. And Lobster Rolls HAVE to have plenty of butter on them, I think. I worked in Connecticut for about six months years and years and years ago and we’d drive around in search of our favorite lobster rolls, Italian food, paella and shopping a lot of the weekends. Come to think of it, we sure ate a lot! Lobster rolls? I’ll take them with butter or with mayo. They’re delicious either way. Goodness gracious I want this right NOW!!! LOVE hot buttered lobster rolls. Want one now! And a cold beer, please. Thanks. Holy cow. Err lobster claw. That’s one pretty looking lobster roll. One I’d devour in minutes, mind you. Lovely stuff! I definitely prefer the buttery lobster rolls, but I am not with you on the bolillo! Way too stiff of a bread. If you can, the next time you make these, pick up the Hawaiian hot dog rolls. They’re exactly the sort of roll you want to eat lobster on. Damn, now I want lobster, and James happens to be anti-seafood. We’re going to have to go out for dinner! Agree on the roll, but a hawaiian or potato roll is too sweet and will detract from the lobster. You get the butter taste from the toasting of the hot dog roll, and the mayo is essential for authenticity. If the meyo taste is too heavy, you’ve used too much.